Important Note: We HIGHLY recommend that you purchase motors threaded in both directions. Prop strikes where bolt threads match rotation can lead to loosened and lost mounting hardware. Now...on with our regularly scheduled programming. 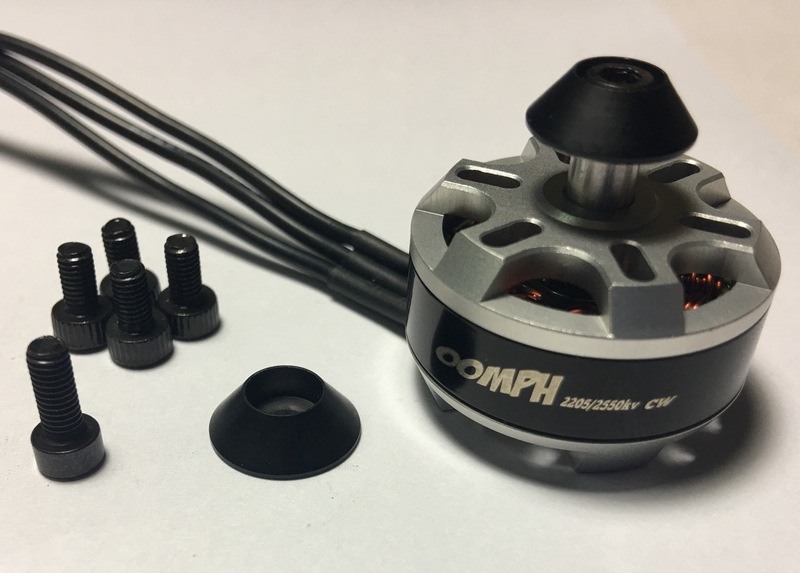 Do you love the style and features of the OG OOmph, but are looking for something that weighs a bit less, spins a bit quicker? If so, Armattan's OOmph 2205 motors are the choice for you. Designed and produced with the finest quality materials, these brushless beasts provide thrust to rival your finest 2206's. For more details, just eye up Ryan Harrell's review over at Miniquad Test Bench. 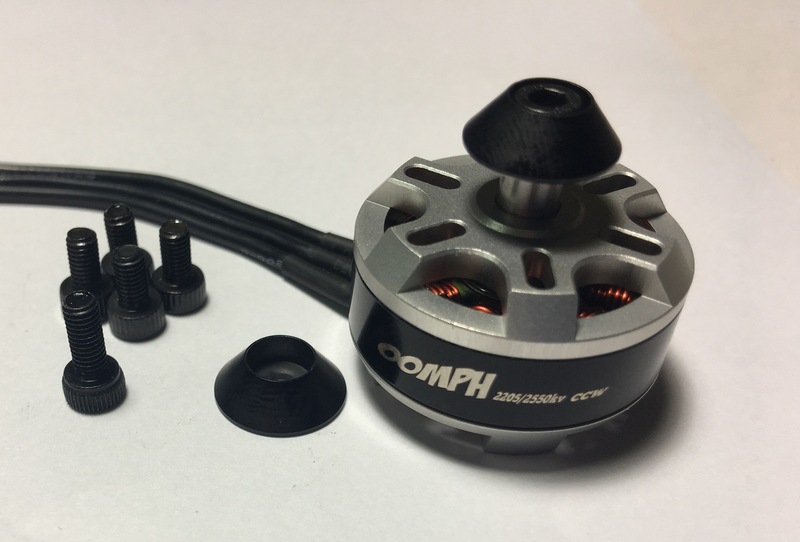 These motors give you what you want and expect from the OOmph series; an M3/22xx mounting pattern, a screw that secures a hollow shaft, and genuine NMB bearings. Like the first motor in this lineup, Armattan's unique twist comes in the form of the OOmph prop-fastening adapter on top. Why this design? Well, by now you know the drill. After rigorous testing (read: lots of crashes) it was observed that standard exterior-threaded shafts can be heavy, can bind on props, and require large hardware to remove (who wants to carry around a socket wrench?). This is why the OOmph motors were conceived with a better solution. A new approach to a familiar task. With Armattan's innovative design changing props is easy. All that holds the propeller down is a standard M3 bolt and washer combination on the top of the motor. Once the bolt is unscrewed, the propeller and washer will slide off of the smooth shaft. Gone are the days of fighting to pull off a blade-less hub and coming away bruised and bloodied. Besides eliminating binding, the OOmph motors have a shorter (lighter) shaft and require only a hex-key (Allen Wrench) for a prop-swap. Another added feature of this solution is that the bolts are threaded opposite of the rotation direction. Since we don't yet have nylock bolts, this causes any impact to the prop to tighten the prop instead of unscrewing it. A final feature, though perhaps the least functional, is that the aluminum is provided in a pure silver color. This will match your silver (or Suki) Chameleon frame a bit better, or even will look fine on another brand (it's okay, we forgive you). If these aren't quite what you're looking for, take a gander at our 2206\2300kv OOmph's (with the orange bell), or scope out our 1407\3850kv version! A massive thank you goes out to Andrew Meyer and Matt Denham. Andrew, based in Canada, had the novel idea to reverse threading on a motor shaft. For a long time, this was not really possible because most motors were using aluminum propeller adapters. Not that long ago, however, many motor manufacturers began using hollow stainless steel shafts as propeller adapters instead of alumi. The idea, as elusive or as obvious as it may be, is to utilize the stainless steel shaft in a smarter, lighter, stronger, and lower profile application. Simple, but brilliant. Matt Denham, based in the UK, designed the motor top. We wanted no frills. We knew that by using a shorter shaft we were dropping weight and we used this weight to complement a sturdy motor top. Matt's work alongside Andrew's originality and the latest racing motor technology sees results that exceed our expectations. This results with a product that is light and tough, with a unique prop mounting system, and power to rival your favorite 2206. Oomph! Important note 2: CW and CCW engraving on the motors refer to motor rotation, not thread rotation.